"El cuerpo de la mujer no es botín de guerra" is a slogan of the Ruta Pacifica de Mujeres in Colombia. 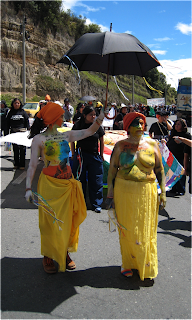 This photo is from their mobilization in Nov. 07 where they shut down the border between Colombia and Ecuador to highlight how many women are being forced to flee their homes and cross that border, and how war particularly affects women. When I first heard this slogan the term that came to me in the moment was war booty, which not only sounds like pirates, but makes you think of women's butts! Clearly one to avoid. So my next thought was spoils of war, but that is a much higher register in English and sounds ridiculous in a chant. Women's bodies are not war trophies, now that seems to do it.